Opera singer Russell Watson has been recruited by Visit Manchester to perform at the London launch of its new C&I initiative, Manchester Live. 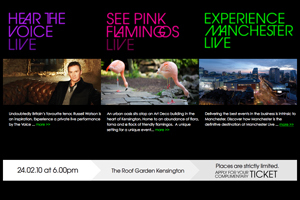 Russell Watson will perform at The Roof Gardens, Kensington High Street, on 24 February, to highlight Visit Manchester's presence at International Confex, which runs from 23-25 February at Earls Court. Visit Manchester managing director Paul Simpson said: "The recession has hit the conference industry hard - particularly the corporate sector - but we've got the product, the infrastructure and can offer significant cost-savings compared with other areas of the UK. "Confex brings together more than 100,000 of the most influential people in the business and it's the perfect time to show the industry what we've got." More information is available on the Manchester Live website.